Soft body armor has become part of the standard uniform for law enforcement and police officers. It can protect you from dangerous situations and has proven to save the lives of many police officers in the United States. As body armor becomes an everyday garment for law enforcement, it is important to understand both the protection level of your armor and how to wear it with an external tactical vest carrier. The current NIJ (National Institute for Justice) Standard 0101.06 sets requirements and tests for the ballistic resistance of personal body armor. The NIJ Body Armor Classifications place personal body armor into five types based on the level of protection – Type IIA, Type II, TypeIIIA, Type III, and Type IV. Each type of body armor is proven to withstand the threat of a certain ballistic weapon. Most law enforcement agencies use Type IIA, Type II, and Type IIIA standard body armor, depending on the threat level and weapons most commonly used in their particular area. Type II body armor is often utilized by police officers for everyday wear, while Type III and IV may be utilized by SWAT and Narcotics Teams that have a heightened need for protection. Type III and IV ballistic-resistant body armor is often inserted into a tactical outer vest carrier to create a bullet-resistant vest ensemble. Where do Blauer’s Armorskin and TacVest fit in? The technology and reliability of personal body armor has advanced tremendously over the past few decades. However, the comfortability and discreetness of typical body armor and external vest carriers is lacking. Officers need a vest carrier cover that provides a comfortable distance between the body and the physical body armor plates. For police officers that choose to wear body armor on a daily basis, it is important for the external vest carrier to look professional while still not screaming “here’s where my body armor ends” to a potential assailant. In other situations, a tactical vest carrier cover with MOLLE may be the best fit to hold multiple pieces of tactical equipment and other gear. Finally, it is essential for your vest to be easy to put on for unexpected situations. Not many external vest carriers offer these characteristics – that’s why Blauer created ArmorSkin, a police uniform shirt vest carrier. ArmorSkin is designed for officers who want both protection and a professional, traditional appearance. This external vest carrier cover allows you to insert your existing ballistic body armor panels and seamlessly blends with your ArmorSkin base shirt underneath - creating a highly protective bullet resistant ensemble that maintains a discreet appearance. 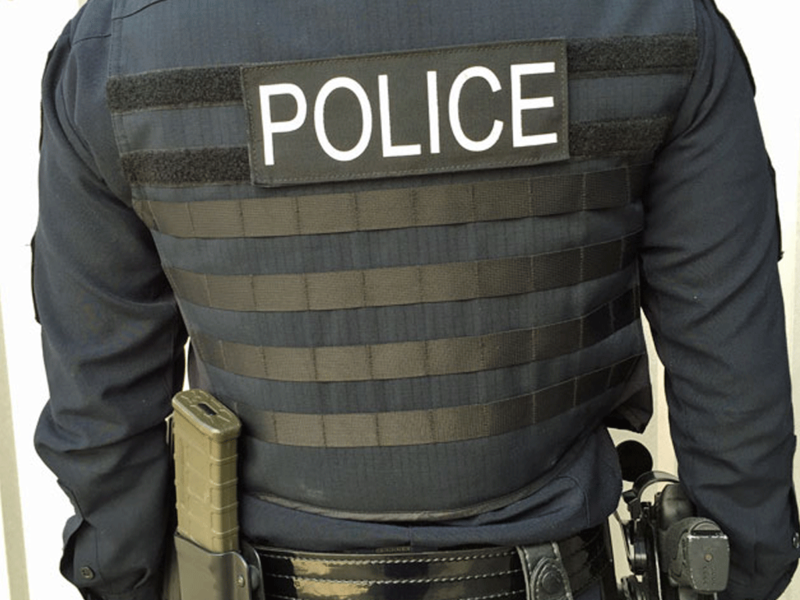 ArmorSkin features all of the traditional compone/nts of a police shirt including, pleated pockets, pencil slots, mic tab, and epaulets, with additional nylon mesh side panels for breathability. This outer vest carrier is offered in eight colors to match the great majority of public safety uniform, and was built to meet both your needs and the professional standards of your department. If you prefer a more tactical look in your outer vest carrier, the Armorskin TacVest is a great option. The TacVest converts existing body armor carriers into a comfortable tactical vest with multiple rows of MOLLE material to hold your tactical gear. With many areas to store your gear – radios, mag pouches, and cuff cases – the heavy equipment of your duty belt will be better balanced across your upper body. The TacVest is the ideal “go vest” for short-notice, tactical situations like an active shooter or SWAT mission. This MOLLE outer vest carrier can hold your entire soft body armor carrier, including straps, for customized protection in any tactical situation. Blauer’s TacVest is offered in both navy and black, which look professional over a traditional uniform shirt or a more casual polo or t-shirt. Whether you prefer a more traditional appearance or a heavy-duty tactical look, Blauer’s tactical vest carrier covers will keep your body armor concealed and keep you protected. About the Author: Lauren Coakley writes on topics of interest to the public safety community for Blauer.